476 pages | 3 B/W Illus. Advancing Criminology and Criminal Justice Policy is a definitive sourcebook that is comprised of contributions from some of the most recognized experts in criminology and criminal justice policy. The book is essential reading for students taking upper level courses and seminars on crime, public policy and crime prevention, as well as for policy makers within the criminal justice sphere. There has been a growing recognition of the importance of evidence-based criminal justice policies from criminologists, policymakers, and practitioners. Yet, despite governmental and professional association efforts to promote the role of criminological research in criminal justice policy, political ideologies, fear, and the media heavily influence criminal justice policies and practices. Mental illness, gender, aging and indigenous communities. For a quick, concise review of what is known about the effectiveness of current crime prevention practices and policies, this is your best resource. This volume provides a much needed critical assessment of contemporary criminal justice policy and practice. For a quick overview, this is the most comprehensive review available and the focus on policy is particularly welcome, given the limited credible evaluation evidence for this type of intervention.This scope of this volume is very broad, with short concise reviews of a wide range of current crime prevention practices and policies by the leading experts on specific types of intervention. The editors have assembled a veritable who’s who of internationally renowned crime policy scholars for this volume, promising incisive reviews of critical issues across policing, courts, corrections, sentencing, and crime prevention. The authors deliver on that promise with precision, clarity, and insight. Skillfully weaving together theory, empirical evidence, and practical considerations to create a rich portrait of contemporary crime and criminal justice policy, each entry helps to clarify effective and cost-efficient ways forward. Notably, the essays also offer important counsel against relying on "common-sense" approaches to crime, which have often proven to be less than helpful and sometimes damaging. As the United States emerges from a period where ideology seemed to drive much of criminal justice policy, this book is essential reading for anyone who desires to have a meaningful impact on public safety. The American public’s concern about crime and the criminal justice has reached unprecedented levels. Media coverage of police killings of civilians has raised awareness about police use deadly of force, and data showing that the U.S. has the highest incarceration rate of any industrialized nation has spurred calls for reform. The pressure to "do something" about crime is strong. But past policies have often been based on sound bites and not empirical evidence. This book changes that. Advancing Criminology and Criminal Justice Policy is a sophisticated and intelligent book that covers an impressive array of topics. Each chapter summarizes the best available evidence on crime and crime control but—more importantly—it considers how scientific knowledge can be used to design better strategies. The contributing authors are all trusted experts, and each chapter is concise, accessible, and jargon-free. The succinct introduction to each major section makes this an ideal textbook for criminology courses. But the book isn’t just for the classroom. Advancing Criminology is a must read for anyone interested in reforming criminal justice in America. This book provides, through examples and thoughtful writings, evidence-based research strategies that can be used with policy makers to make improvements in both individual and community justice in our dynamic criminal justice system. This is clearly the single best volume on the subject of evidence based criminal justice policy. It should be an indispensable resource for scholars, practitioners, and students. I recommend it without reservation. 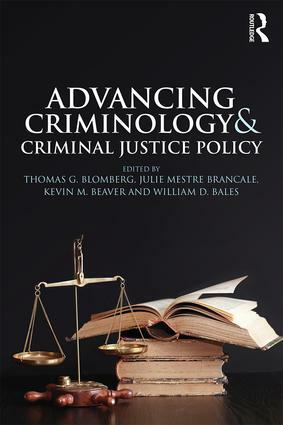 Advancing Criminology and Criminal Justice Policy offers a timely and important collection of essays by an internationally-renown set of scholars who are the fore of bridging the criminological/criminal justice divide. It is refreshing to see the authors demonstrate that our field cannot do one without the other. As criminologists, our main task is to conduct the most objective scientific work possible within the constraints of the data we have. Getting that material in a palpable way to practice and policy audiences is also necessary if we are to be ‘at the table’ when it comes to informing the policy response to crime and criminals. Blomberg and his colleagues have done our field a huge service. This book is stellar. Thomas G. Blomberg is Dean and Sheldon L. Messinger Professor of Criminology, and Executive Director of the Center for Criminology and Public Policy Research at Florida State University, USA. Julie Mestre Brancale is a doctoral candidate and graduate research assistant for the Center for Criminology and Public Policy Research at Florida State University, USA. Kevin M. Beaver is Professor in the College of Criminology and Criminal Justice at Florida State University, USA. William D. Bales is Professor in the College of Criminology and Criminal Justice at Florida State University, USA.